Clear all jellies and reach 1560000 points to complete the level. This level has hard difficulty and you need to use good technique to complete this level. For this level you should try to play striped candy combo as you get the chance like first try to break the black blockers and as you have more candies to play then make striped candy with wrapped candy combo or striped candy with colorbomb combo to break more blockers and jelly. After play more with jelly candy and use more special combo to reach the target. 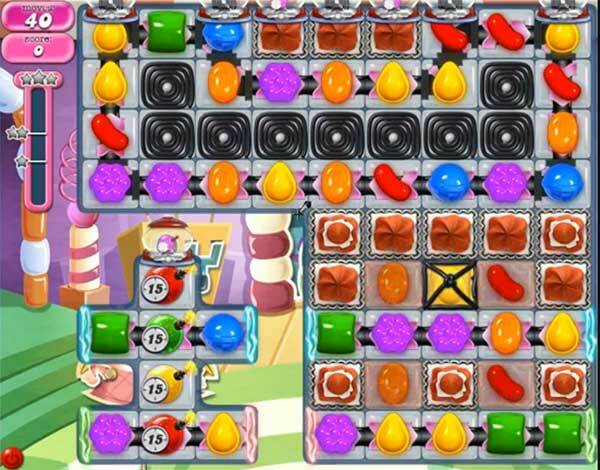 You could use lollipop booster to break the jellies or blocker that you can’t within 40 moves. I have played this one for months now and realy a few times a day. There is no way getting through it without at least 10 lolly hamers (which they want you to buy). There have been some hard games but this one beats it all. I think they should alter it. Every time I play this #%&%#@$ level I hate it twice as bad as the last time I played!!!!! That’s it! You beat me level 765! I’m through with King games!!!! Back to Bejeweled and spades I go!!!! I feel your pain Susan! I finally figured how to beat this %$#$%$% level. I will save up 55 lollipops from the free daily spin. Maybe I’ll be able to save up that many lollipops in 6mos and get off this POS level. Total BS!!!! 765 is the level that caused me to quit. I’m not even sure that Gwen’s idea about saving up 55 lollipop hammers will work. Over 300 tries now and I’ve never been close to finishing. There have been too many “finish by luck only” levels already. I can’t imagine the amount of luck needed to beat 76. I was shocked to see these comments. I beat 765 on my 2nd try with no boosters. Maybe they changed it before I tried it, or maybe it was sheer luck. I think sometimes they try and make levels appear hard so you will over think them and focus on beating them one way only. i under how you all feel. However, remember it’s just a game. There’s more important things in life to focus on. God bless always! I am a novice and did not find this hard; used lollipop hammer. Don’t give up! I got it after a few tries and only used that little hand thing that switches candies once! While this wasn’t my favorite level, it was doable with a little luck!